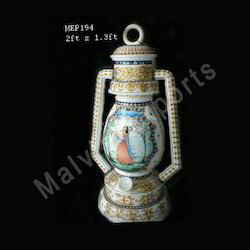 MALVIA EXPORTS brings decorative Marble Lanterns, which is designed under the stringent supervision of experts. The decorative Marble Lanterns are specially adorned with delicate stroke of gold jali work. The Marble Lantern we send to the market is manufactured for varied purposes. We have established a name of repute in the industry for supplying artistically designed decorative and floating type Marble Lantern. Marble Lanterns offered is made available under item code MEM 94 and comprises lantern in Jali finish in heights of 12"inches. Being highly decorative in finish, these beautifully handcrafted marble finishes based lanterns come adorned with exclusive gold jali work that further enhances the look and finishes of these marble handicraft pieces. Highly suitable as a home décor item, we can also customize these as demanded by the customers. 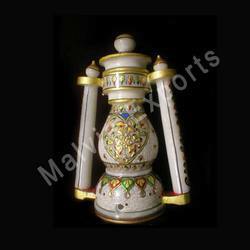 We are a leading manufacturer of Beautiful Marble Lanterns which are just a home decore product. Luxury craft for your homes just made by single stone marble colorful decorated with colors. 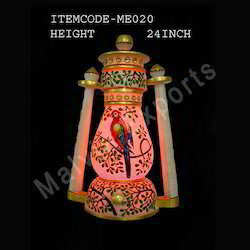 Decorative Designed Marble Lanterns offered is made available under item code MEM 94 and comprises lantern in Jali finish in heights of 12"inches. Being highly decorative in finish, these beautifully handcrafted marble finishes based lanterns come adorned with exclusive gold jali work that further enhances the look and finishes of these marble handicraft pieces. Highly suitable as a home décor item, we can also customize these as demanded by the customers. 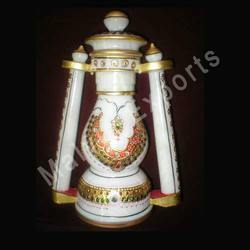 Unique Marble Lanterns offered is made available under item code MEM 94 and comprises lantern in Jali finish in heights of 12"inches. Being highly decorative in finish, these beautifully handcrafted marble finishes based lanterns come adorned with exclusive gold jali work that further enhances the look and finishes of these marble handicraft pieces. Highly suitable as a home décor item, we can also customize these as demanded by the customers. Floating Lanterns offered are offered under item code MEM136 in sizes of 8"inches. Coming in beautifully designed finish, these feature quality marble base and are developed by experts so as to provide in these flawless finish standards. Featuring highly decorative designs, these come with delicate stroke of gold jali work that helps in enhancing the overall finish of these floating lantern pieces. We can also customize the same as demanded by the customers. Marble Lanterns offered is made available under item code MEM 94 and comprises lantern in Jali finish in heights of 12 inches. 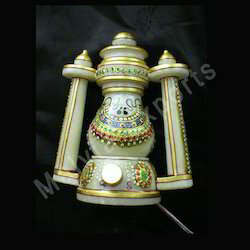 Being highly decorative handicraft product is finish , these beautifully handcrafted marble finishes based lanterns come adorned with exclusive gold jali work that further enhances the look and finishes of these marble handicraft pieces. Highly suitable as a home décor item, we can also customize these as demanded by the customers. 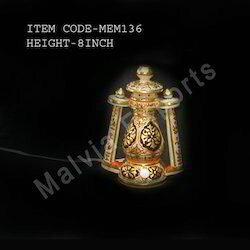 Hanging Marble Lantern offered is made available under item code MEM 94 and comprises lantern in Jali finish in heights of 12"inches. Being highly decorative in finish, these beautifully handcrafted marble finishes based lanterns come adorned with exclusive gold jali work that further enhances the look and finishes of these marble handicraft pieces. Highly suitable as a home décor item, we can also customize these as demanded by the customers. 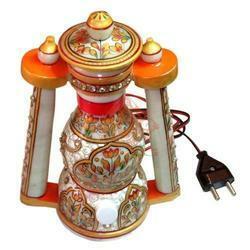 We are a leading manufacturer and supplier of Marble Lanterns. 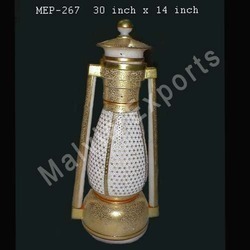 Marble Lantern offered is made available under item code MEM 94 and comprises lantern in Jali finish in heights of 12"inches. Being highly decorative in finish, these beautifully handcrafted marble finishes based lanterns come adorned with exclusive gold jali work that further enhances the look and finishes of these marble handicraft pieces. Highly suitable as a home décor item, we can also customize these as demanded by the customers.